During the angioplasty procedure, the arteries that have been affected by plaque deposits are cleared. The term ‘angioplasty’ consists of two words, ‘angion’ (vessel) and ‘plosso’ (mould). This technique is used to widen or open up blocked or narrowed arteries, which are vessels that carry oxygen rich blood. The repaired artery then efficiently carries blood and oxygen to the organs ahead. Coronary (heart) angioplasty, also labelled as Percutaneous Transluminal Coronary Angioplasty (PTCA) or Balloon Angioplasty, is a non-surgical procedure. During the angioplasty procedure, the repair of blocked arteries is carried out by inserting a catheter through the skin (i.e. transcutaneous), and pushing it through the arterial lumen (i.e. transluminal) – hence the name. Doctors are likely to advise going for an angioplasty procedure if you experience atherosclerosis symptoms, which include chest pain and nausea. Before choosing the treatment method, though, you’ll be taken through a diagnostic test, an angiogram procedure, when the condition will be confirmed. If you have been advised to undergo angioplasty and are anxious about the surgery, put in the effort to learn about angioplasty risks, so that you can prepare yourself physically and mentally for the surgery. Here’s a quick account of what goes on during the procedure. You will be made to rest in the cardiac catheterisation laboratory, where the angioplasty procedure is normally performed. Your vitals (blood pressure, body temperature, pulse rate, respiration) will be constantly monitored throughout the procedure. The doctors will administer fluids through the veins to maintain healthy circulation and fluid volume, and anaesthetics will be injected to ease the pain and prevent the formation of blood clots during the angioplasty procedure. An ECG (electrocardiogram) is generally used to monitor the heart’s status. Commonly, the artery in the groin (also known as the femoral artery) is where the catheter will be inserted. In some cases, the artery along the arm or hand may also be used. The skin over the area will first be cleaned thoroughly with antiseptics in order to prevent infections, and a small incision will then be made to access the underlying vein. A long and thin catheter, which is a plastic tube of 2 to 3 mm diameter, will then be inserted into the artery and pushed ahead till the desired site is reached. The path of the catheter will be monitored through X-rays, and doctors will use real-time X-ray exposure to guide the catheter inside the blood vessels. In coronary (heart) angioplasty, the catheter is pushed till the coronary arteries, where the radio-opaque dye (also known as radio-contrast dye) is injected. The injected dye then flows freely through the artery, exposing the exact site of narrowing/block. Your doctor will then try to reach the site of arterial block through the catheter, to remove the same. During the angioplasty procedure, a balloon catheter is guided through the artery to remove the block. 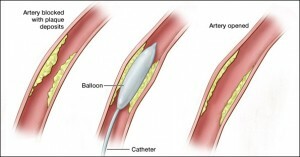 After locating the block, your doctor will insert a thin wire into it in order to guide a second catheter, which is also called the balloon catheter. A balloon catheter is designed in such a way that it can be inflated inside the arterial lumen. The balloon will be inflated for about 1 to 2 minutes and then deflated. This step may be repeated intermittently as blood flows during deflation. The inflated balloon will press and squeeze the plaque against the arterial wall, clearing the lumen. Once the block is cleared, normal blood flow will soon resume. In order to keep the cleared artery intact, your doctor will place a stent at the repaired site. Stents are wire mesh tubes that are designed to be retained inside the vessels. They help prevent the collapse of a repaired artery after the angioplasty procedure, and the need for a stent usually varies depending on the patient and the nature of arterial block. Medicated stents (which have clot preventing drugs applied over them) are more beneficial as they reduce the rate of re-stenosis (re-narrowing) of arteries. Your doctor will gradually pull the catheter out from the site of insertion, which will then be covered with cotton bandage. Once the angioplasty procedure is done, you will be put under observation and your vitals will be monitored for a few hours. In normal cases, patients start walking with assistance just six hours after the procedure. Doctors also prescribe some long term and short term measures for angioplasty recovery. How Long Does The Angioplasty Procedure Take? An angioplasty might take anywhere between 30 minutes and 3 hours, depending on the status of the individual and the difficulties that arise during the procedure. This entry was posted in Angioplasty and tagged Angioplasty Surgery, Stent Procedure by Dr. Harshal Narkhede. Bookmark the permalink.